Montessori International College is an independent, non-denominational IB World School renowned for its innovative learning spaces and highly experienced and dedicated teachers. 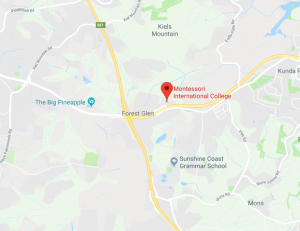 Situated in the heart of the Sunshine Coast in Queensland, just 10 minutes from the Maroochydore CBD, the school caters to young people from 3 years through to 18 years of age and offers the prestigious International Baccalaureate Career-related Program in Years 11 and 12. MIC’s new campus is located on 22 hectares of bushland and is developing into an international benchmark for quality Montessori education. MIC is a green school which prides itself on its engagement with the natural environment and the local community. Small by design, we currently have less than 350 students which allows us to provide a quality Montessori education and highly personalised learning programs, with the benefit of economies of scale as we sustainably grow our school. Students at Montessori International College enjoy a learner-centered education. They experience hands-on, independent and purposeful learning as well as the support of a caring and inclusive community. Surrounded by nature, learning occurs in beautifully designed eco-friendly learning spaces under the guidance of highly skilled teachers. These learning spaces provide nurturing, aesthetically pleasing environments for MIC students to engage their intellectual curiosity and realise their creative potential. Montessori students learn how to ask questions and know where to find answers. With the extra attention we provide in a small school environment, our students consistently demonstrate independence, accomplishment, responsibility for self and others, civility and an enthusiasm for distinction in all they do.